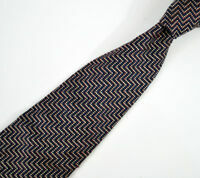 Brioni Multi-Color Striped Silk Tie Made in Italy Size 63 1/2" x 3 1/2"
New Brioni Gray Wool & Silk Geometric Tie Length 62" Width 4"
BRIONI Silk Tie. Golden Brown Paisley. Hand Made in Italy. Brioni 100% Silk Blue Gold Abstract Tie Hand-Made in Italy 60"